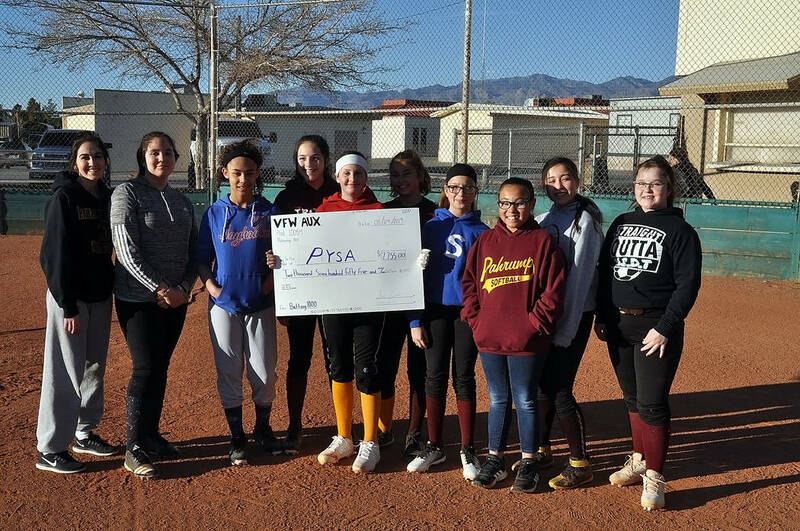 The Veterans of Foreign Wars Auxiliary presented a check for $2,755 to the Pahrump Youth Softball Association on Friday at Petrack Park, the group’s share of the proceeds from the Batting 1.000 Classic earlier this month. Horace Langford Jr./Pahrump Valley Times Pahrump Youth Softball Association players pose with an oversized check representing $2,755, the proceeds from their Batting 1.000 Classic game earlier this month against the Veterans of Foreign Wars and the VFW Auxiliary at Petrack Park. Money was raised not by charging admission but by holding raffles for gift baskets and dinners at area restaurants, along with a “Fill the Glove” campaign at Walmart and Maverik for two weekends before the March 3 game at Petrack Park. The PYSA team defeated the VFW and VFW Auxiliary 12-11. Paul Claypool hit a hole-in-one March 5 at Lakeview Executive Golf Course of Pahrump. Claypool’s ace came on the 148-yard ninth hole and was witnessed by Roy Barnes, Mike Parkalla and Barbara Stoddard. The achievement was certified by Jean Kocvara at the Lakeview pro shop. Lakeview Executive Golf Course, featuring five par 4s and 13 par 3s, is located at 1471 E. Mount Charleston Drive South. For more information, go to lakeviewgolfpahrump.com or call 775-727-4040. The Pahrump Nugget Bowling Center has announced a full slate of summer leagues for men, women, seniors and kids. There will be leagues available six days a week, with times from 10 a.m. to 6:30 p.m. Leagues start as early as April 5, when the Friday morning Beat Your Own Average league begins, until June 5, when the Wednesday afternoon Summer Kids league gets underway. The kids league drew around 80 participants last year, according to bowling center manager Lorie Hartwell, who stressed that whatever your age and whether you want to bowl days or nights, there is a league open to you. For more information, drop by the Pahrump Nugget Bowling Center or call 775-751-6525.